Are you trying to work out the best way to organize your home office, but are low on space to do so? Perhaps your home office has already been created in your apartment somewhere but you’re trying to make it more efficient? The best examples of an efficient workspace are both conducive to performance and concentration as well as being uncluttered and well thought out. In this article, we look at some of the clever organizational tips for home offices made in even the smallest spaces. Desk space is one of the most important aspects of any office. While you don’t have to have a huge amount of space in your home office, especially if you’re working from a laptop, a good desk can double up as great storage. Many desks have either compartments below or even shelves above. There are plenty of compact desks which manage to utilize the space above and below your workstation. Shelves for your books, notebooks, and magazines above and even space for your printer can make your workspace super efficient, even if it is only a few feet wide. Some desks also offer folding features, draws and other space-saving shortcuts, so choose wisely if you are in the market for a desk. This sounds obvious, but there are many aspects you may not have considered. If you’re setting up somewhere small, such as the corner of an apartment, you will need to strip back anything that’s not essential to maximize your workspace. Instead of a bulky office chair, make use of a smaller stool design. Instead of pedestal lights, make use of efficient and space-saving lights such as the string lights mentioned in this article about lighting a room without overhead lights, or many of the impressive range of lighting fixtures by Allen and Roth. 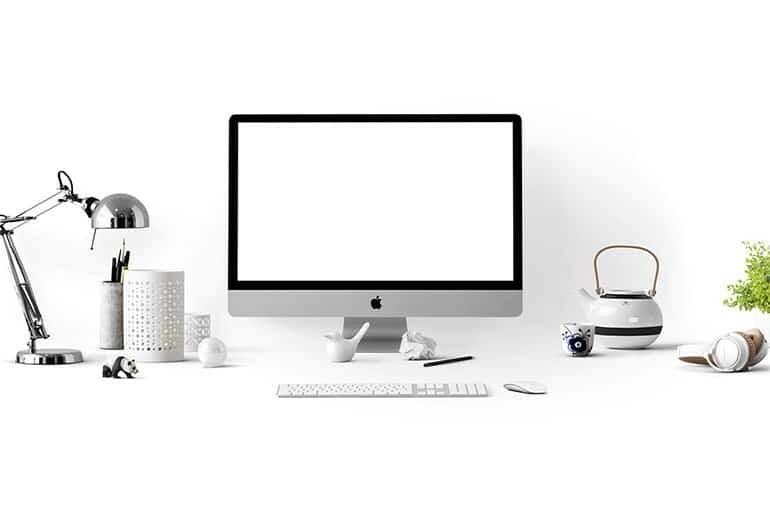 If space is really limited, it could be time to get creative about what items you really need in your home office, and switching to a minimalist design. For many of us, a space to sit with a coffee and a laptop is enough. Many people are guilty of not giving enough thought to the productivity of a space. We come to our home offices to get stuff done. So how can the design of a space influence our productivity? Having fewer decorations and unneeded items close at hand can minimize distractions, one of the tips on making an amazing workspace mentioned here. Lighting is another often-ignored, yet a crucial area of a space in which we can get things done. Humans function better with natural light, so if you can embrace windows to let the light pour into your space, do so. If not, ensure you utilize lights which closely mimic natural light, such as the options discussed in this post about best lighting for an office with no windows. They will keep you alert throughout the day. Anyone who has spent a lot of time working from home will know that the line between ‘work’ and ‘play’ can quickly become blurred. Even if you aren’t on office time, your home office should ideally be separated as a place where you get your nose to the grindstone. If you aren’t able to shut yourself away in a separate room (or even closet) for your home office, think about other ways in which you can shut yourself off in that space. For instance, you could use a room divider, which can double up as a space to hang a calendar, clock or anything else you might need while working. Anything that can keep you from the temptations of the TV screen and send the signal to your brain that this is the space in which you work will no doubt increase productivity. Have you enjoyed our tips on creating an efficient home office? You don’t need a huge space to make this work. If you have more tips to share or wish to join the conversation, feel free to leave a comment below.